As time goes by, more and more people are replacing their baths with single or double shower enclosures or wet rooms with a toughened glass screen. Those that choose to keep their baths, want to replace their old shower curtains with a glass bath screen. Glass shower and bath screens look far more attractive than the old plastic curtains and don't suffer from the nasty brown and crusty build up of lime from the hard water like the latter do. Splashbacks of Distinction manufacture, supply and fit bespoke, frameless glass shower doors, shower screens, shower enclosures or bath screens to make your bathroom a place you really want to spend time in. Our toughened glass shower doors, screens and enclosures are without a shadow of a doubt one of the most important elements of modern shower design. The glass whether it be clear, textured, sandblasted or printed with a high definition picture, will run rings around that tired old shower curtain. As long as you don't choose the clear glass option, the person in the shower has their dignity protected just as much as when they used a shower curtain. 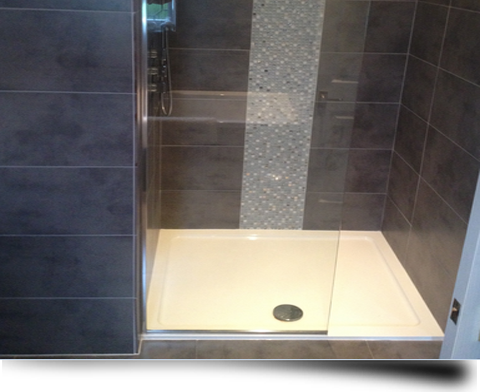 The other great thing about the modern glass doors, screens or enclosures is that they do a much better job of keeping the water inside the shower base or bath too. At Splashbacks of Distinction we don't sell any off-the-shelf stock glass products, so everything you buy from us will be a bespoke fabrication that is based on exact sizes and your design preferences. One of our highly skilled measuring and installation team members will take the exact measurements to ensure you are never left with any unsightly gaps that water can escape through. Because Splashbacks of Distinction only manufacture, supply and fit bespoke shower enclosures, glass doors and screens, you can rest assured that we manufacture them to suit any awkward locations such as loft conversions or bathrooms that have a low, sloping roof. So if you are looking for a glass shower screen that is unique or unusual, Splashbacks of Distinction will do their level best to find the solution. The problem with most shop bought shower screens or enclosures is that they are made to standard sizes. These standard dimensions will usually prevent you from having your shower installed under the sloping ceiling of a loft conversion. Our bespoke shower doors, enclosures and bath screens can be manufactured to fit almost anywhere and are perfect in situations like a loft or an en suite in a bedroom alcove. At Splashbacks of Distinction we really do understand the real meaning of bespoke! Our made to measure shower enclosures will be manufactured to fit to the nearest millimetre into whatever space you want. |So whether you want a simple shower door with a slope to accommodate a low ceiling, or a complex frameless glass shower enclosure, Splashbacks of Distinction will offer you a made to measure solution that genuinely meets your requirements. Why not call us at Splashbacks of Distinction and we can help you decide what it is that you need. A fully qualified glass specialist from our team will discuss your requirements with you. This will include issues such as the position of any pipe work and any access constraints before suggesting the best layout and design options available. The best way for us to give you the perfect shower solution is to conduct a home visit. It stands to reason, if we get to see the intended space first hand, we are in a much stronger position to manufacture , supply and fit a toughened glass shower enclosure that exactly meets your requirements. So if you want a bespoke bath screen, shower screen or enclosure, contact Splashbacks of Distinction and discuss your requirements with us today. Our extensive knowledge of bespoke glass products will ensure that your bespoke shower enclosure will fit perfectly and look amazing for years to come.